Adventure, Art, Culture: Final Post! It is hard to believe that tomorrow night, we'll all be back in Oregon! We have had a fantastic adventre, but we're all very ready to be back with family. London has been fantastic (of course) and there never really is enough time to see all of the amazing things this city has to offer. 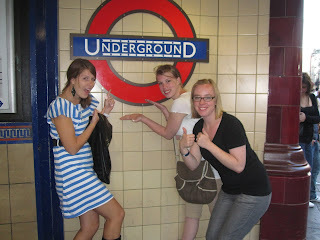 However, here is a highlight of all the things we did in London! The Ungerground was intimidating at first but we mastered it! The most memorable moment of the underground is when some of us became impatient with the elevator and decided to take the stairs to the top. 193 steps later, we realized that it was a huge and painful mistake. There were so many choices when it came to the musicals in London. Many of the group saw at least two shows. Terrie and Jerries saw three!! 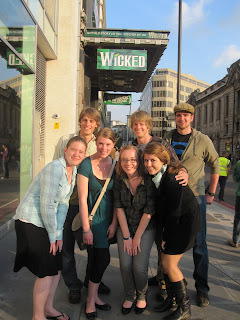 Here is the group at "Wicked." 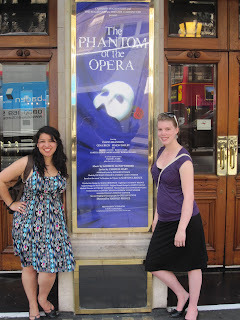 Here is Allyson and Vanessa at "The Phantom of the Opera." We also saw the Globe Theatre where Shakespeare's plays were premiered. 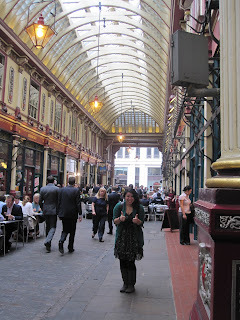 There are a plethora of museums, art galleries, and historical sites in London. We visted the National Portrait Gallery, the National Gallery, the Tower of London (where we watched a reenactment of Lady Jane Grey's beheading), the British Museum, Imperial War Musem, St. Paul's Cathedral and Westminster Abbey. 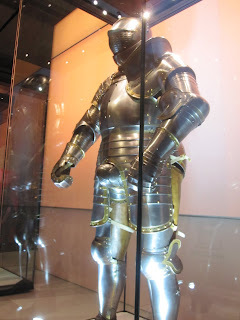 This picture is of Henry VIII's large armor. He was a fat man and if we've learned anything on this trip, it's that Henry VIII terrorized a lot of people and was an all around jerk. 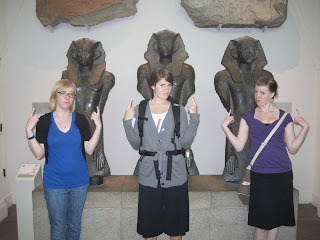 This picture below is of Allyson, Bethany, and Katie appreciating the Egypt Exhibit at the British Museum. 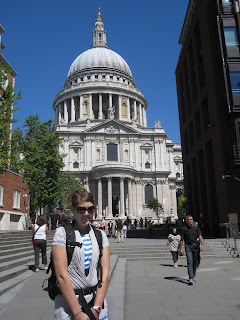 Katie in front of St. Paul's Cathedral (which is mostly popular because of its use in the movie, "Mary Poppins." So, there are a few Harry Potter fanatics on this map and being in London meant that we were able to see where some of the Harry Potter movies were filmed. This is Diagon Alley (the magical street where Harry and his friends buy their magic school supplies.) However, on an average non-filming day, this street is filled with business men and women having their lunch breaks. We also saw Platform 9 and 3/4, which is where Harry and his friends enter the magic wizard train platform that whisks them away to school. Ya, it was pretty great. Well, we conquered Ireland, Wales, and England! This has been an amazing experience for all of us. On behalf of all of us students, I'd like to thank Terrie and Jerrie for being our fearless leaders on this adventure and our parents for sending us prayers and the occasional email. =) We missed you all. We'll see you tomorrow night!